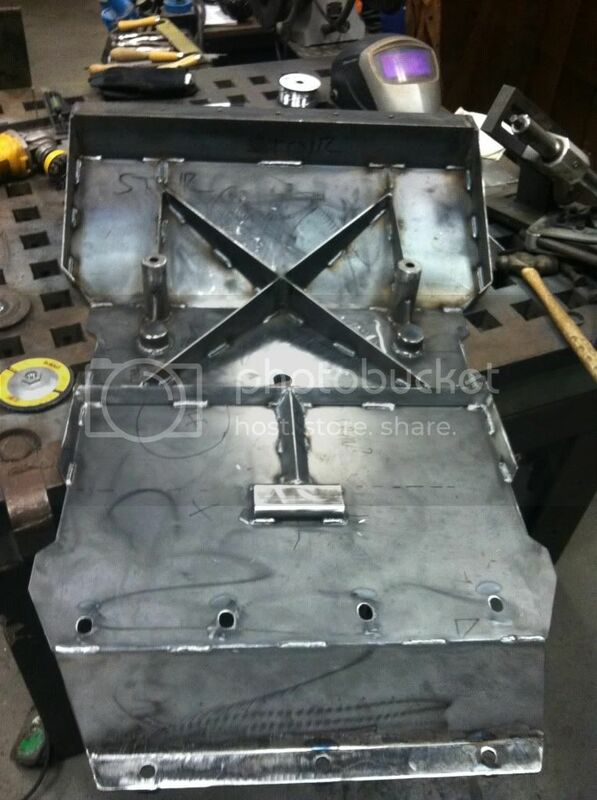 I've looked through this forum and others for pro's/con's and general comparisons of the two skid plate set up's (aluminum and steel). I have seen Toyota offer aluminum skid plates in their TRD line of products. Also, I've seen certain aftermarket companies, like RCI, offer aluminum skid plates. I know that in general aluminum is lighter (maybe less expensive too?) than steel, but steel, while heavier, offers greater durability and protection. So my question is why when/where does it make sense to use aluminum over steel for skid plate protection? Can aluminum withstand certain amounts of abuse on rocky and difficult terrain before they fail? I get the sense that most hard-core rock crawlers go all out with full steel protection. Are there any overlanders who use aluminum skid plates while still tackling trails and moderately technical terrain? Real-world experience/feedback would be greatly appreciated! My choice would be aluminum all day long. Steel is cheap and easy to work with, and the reason it is used a lot of the time . I have never seen a steel skid plate or floor pan on a Trophy Truck! Also I realize that this subject/discussion is not specific to Toyota's, so mods may want to move this into more of a general section. I think it really depends on how often you plan on using them and what your going to be using your vehicle for. Some 1/4" thick Aluminum skids would probably be strong enough and heavy/thick enough for the occasional encounter with some rocks but over time and heavy use would not hold up as well as steel. IMO steel would be my first choice for skid plates that are protecting the most important pieces of your vehicle like the engine, transmission, transfer case, & gas tank. Steel is heavier, yes, but the weight is very low so it will have very little effect on your center of gravity. Steel is much stronger and scraping them over rocks will usually just scratch the paint/powder coat off. Aluminum on the other hand won't hold up as well. I was researching Bud Builts 1/4' aluminum VS 1/8" steel the weight differance was only about 18 pounds, steel being heavier. The cost of the aluminum was over $400 more. To save twenty pounds I dont feel its worth the cost. Ended working on fabricating my own out of 1/8" steel. Shipping cost was another factor to look at. 1/8" mild steel compared to the stamped parts from the facotry is much stronger. biggest thing is how they mount so no ripped off mount bolts etc. If you plan on routinely hitting the skid plates and sliding down rocks with them then to me it seems steel would make sense. But I don't intentionally bash my truck into rocks. The skids are for if I completely eff up somehow so I don't end up breaking very expensive parts of my truck. Or stranding myself after smashing something important. Aluminum can do that job just fine. If it bends pound it back. If it is too bent or broken buy a new one and don't drive like a moron next time. I can't imagine an expedition vehicle Baja running into a rock at high speed or sliding around rocks on a crawling trip - but there probably are some who do and for them durability would be important. For me and probably most people aluminum will do the job and save weight for a full set of armor. You also have to be very careful about the aluminum you use. Some can be brittle, or can become brittle if subject to vibration or heat. Steel will last longer, be easier to repair and cost less. Trophy trucks are rebuilt after each race, that's not how I intend to treat my rig. I run all 1/4" thick aluminum on the FJ Cruiser. They are from Ricochet and are really great. I just put a real heavy-duty front steel skid plate from Skid Row on the Tundra today. It looks to be very solid. If you're not constantly in the rocks, aluminum can be a good choice. I say can be because I feel that you have to be careful with what grade aluminum you get, how its bent and how it's welded. Ultimately the same is true for steel, but I'm of the opinion that the three criteria I mentioned are "less critical" with steel. If you are constantly dragging the skids over the rocks, I can't say that aluminum would be my first choice. Using the Ricochet skids as an example, after a week in Moab with a stock height FJ, they certainly looked "used" and left some aluminum stuck to the red rock of Moab but did their job admirably. In some cases, there is a significant weight savings with aluminum, but I have seen some well designed and built skids made of thinner steel that perform very well. For the occasional wheeler, who isn't using his daily driver in the rocks a lot, and wants a good baseline of protection with minimal weight gain, and can afford aluminum skids, then I feel they are a great choice. If you're somewhere in the rust belt, you still need to be concerned with corrosion on aluminum skids. People always say aluminum doesn't rust, but it does corrode and if left unattended, it can get nasty. 6061-T6 Aluminum in 1/4 is stronger than 3/16ths steel, and will hold up better to abuse. so 1/4" 6061-T6 skid plates are significantly superior than the ****ty 1/8th inch steel skid plates you guys think are stronger on rocks. is the aluminum worth the additional cost? up to you to decide, but the ALU is much stronger in that thickness and less prone to bending. that said, aluminum will gall on rocks. A LOT. where as steel will just kind of slide over because its 'slicker'. the way around this is to attach cutting board plastic to the bottom of aluminum skid plates. 3/16th is more than enough and is much slicker than steel, and replaceable. this is common practice in rock racing. Aluminum, while more expensive, is lighter and plenty durable for moderate usage on trails and somewhat rocky trails. Steel, while heavier, is cheaper, easier to work with, more durable and the skid plate of choice for more dedicated rock crawlers. I guess a 3rd option is using thinner steel plates, which could potentially be not only cheaper than aluminum but also comparable in weight. Seeing as that I live in the Northeast US, I am inclined to go with aluminum since I rarely encounter "rocky" trails of the same intensity as Moab. And this is my DD I am looking to modify, so anything that saves weight and preserves my mpg will be my focus. Does anyone have a "yes" or "no" recommendation for the TRD aluminum front skid plate offered by Toyota? Awesome feedback! In regards to rust, wouldn't steel have the same rust issues as aluminum? In the north east both steel and aluminum are going to corrode mainly due to road salt, it's up to you to decide how fast and how severe based on whatever you choose to coat it with, or how well you remove the salt. What I was getting at is that a lot of people think aluminum is impervious to corrosion, which is not the case. An example of this would be an uncoated on untreated aluminum wheel after a long winter. I think your third option of thinner steel skid plates is a great option, provided they are braced appropriately, but that involves some design and fab time. I would also hesitate to call anyone's 1/8th steel skid plate s****y without actually seeing them. I have seen some really well thought out and well built thinner steel skids that hold up to abuse very well. Some example of s****y 1/8th inch steel skid plates that work really well and are reasonably light weight. Certainly lighter than their 3/16th steel counterpart. Either way skid plates are a good investment, and for your uses Dalko, I think aluminum would be a great solution. Only you really know what type of terrain your rig will see, and how aggressive you intend on being when negotiating said terrain. Both types of skid plates have their drawbacks and advantages. If it were me, and I just wanted skids for that "just in case" scenario where you tag a big branch or come down on a rock wrong, then I would take a look at the ARB skids for the 4Runner. They will certainly not last if you plan on rolling the Rubicon every weekend, but for the type of terrain that you will see in you region, and if you are careful what you drive over, then they should protect your expensive underbelly from that errant object. They are a cheaper option for sure, are already powder coated, and made to fit your rig. The downside is that they are thinner and subsequently less durable when subjected to constant abuse. Different models depending on whether you have KDSS or not. shmabs, those are nice looking skids!